There were 1300 of them according to the young girl in charge of front-of-house. They filled the stalls and most of the upper circles, and the only empty seats I saw were right by the organ where view was restricted and hearing damage inevitable. 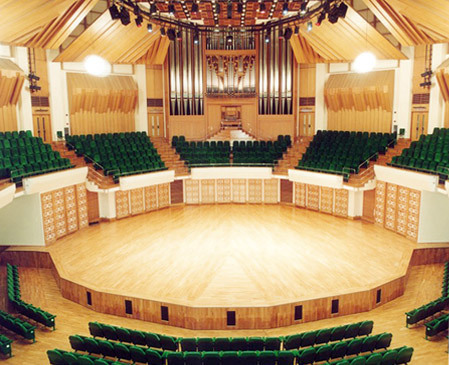 It was not the largest audience to which I have ever performed even as a solo recitalist, and I have certainly paid to packed concert halls before; on two memorable occasions large numbers were actually turned away from my recitals in Kuala Lumpur when the hall reached full capacity. But it was, without a shadow of doubt, the most restless. From the moment I walked out into the auditorium to the moment when the door finally shut behind me, I was surrounded by ripples of sound – chattering adults, giggling children, crying babies, shuffling feet, rustling programme pages, unwrapping confectionary and crisps, a constant stream in and out of the auditorium presumably in search of a toilet and the occasional oohs and aahs when something particularly comment-worthy attracted the attention of those listening to the music. Mercifully no mobile phones or pages – the Hong Kong Cultural Centre effectively blocks these – but a constant level of hubbub which was utterly disconcerting. It wasn’t that they did not like the music. In a programme that ranged from Zachau and Krebs to Nigel Ogden and Zsolt Gárdonyi by way of Karg-Elert, Hindemith and Gabriel Pierné, I really think there was something for everyone (except, of course, died-in-the-wool Bach or Messiaen fans). They were not there under sufferance – children had been queuing up excitedly over two hours before the scheduled start and adults had been anxiously chasing around trying to find the correct ticket counter (inexplicably hidden away on the opposite side of the concourse to the box office) – and they certainly were not there under false pretences – the occasional Saturday early evening organ recital in Hong Kong is a pretty well-established feature and while star names appear once in the season, most of the players, like myself, are pretty much nonentities in the overall scheme of things. No, there was a genuine desire to be there in the hall while the organ recital was one. There just did not seem to be a genuine desire actually to listen to the music once the recital had begin. Performers instinctively know how effectively they are communicating to an audience and how the audience is reacting to the music. When I felt an audience slipping out of my reach during a performance of Britten’s dreadful, dreadful Prelude & Fugue on a Theme of Vittoria (included in my programme only because of the stipulations laid down by the concert organiser), I subtly hurried it along, giving it more lightness and skipping loosely over its dire textural intricacies (having thought that it was these which would possibly appeal to an audience). When an audience became deeply hushed during the Fugue of Hindemith’s Second Sonata, I tried to prolong the spell by making a little more of the rests and the silences in the piece. And when the crowd at Singapore’s Esplanade started clapping along to Nigel Ogden’s Saints on a Spree I confess I hammed it up even more – no apologies due, I’m sure Ogden would have done the same with knobs on. In the event I enjoyed myself hugely for, in the absence of a clear lead from the Hong Kong audience to which I could react, I decided to play everything as if nobody was there and simply enjoy myself. The audience clearly liked what they heard – they stayed through to the bitter end, toilet visits notwithstanding, and many came to see me afterwards to thank me and to recall bits they had particularly liked, they even asked me to go back and play again sometime – and the applause was loud, generous…and frequent. Every hint of a silence, every moment when the organ descended below the level of audibility, they started clapping. Less than two seconds into the Ogden, applause broke out; the grand pause just before the end of the Lanquetuit Toccata elicited a premature cheer, and a quiet moment of intense reflection during the Pierné Cantilene was disrupted by an enthusiastic clapper. The question is why? Audiences in China are simply disruptive; they don’t want to hear music, they just want to see what it is the Gweilos make such a fuss about. Singaporean audiences like people to know that they are musically literate, so make a huge fuss of their applauding and cheering, raising their hands into the air and standing up almost as readily as they do when an SIA 380 touches down. But Hong Kong audiences mystify me. To all outward appearances they hate music, yet they clearly crave for as much of it as they can (even from sub-standard organist nonentities such as myself). We could suggest that the noise level in the hall, the willingness to put up with all manner of interruptions, is an instinctive response to living in such a crowded community where personal space and the luxury of silence simply do not exist. But I have another suggestion. I blame the music examination culture. What? You cannot be serious? I blame the music examination culture! Music is taught to the tens of thousands of children in Hong Kong not as an art form requiring inner concentration but as something akin to a competitive sport testing physical stamina. The enjoyment is derived from the visual effort of the protagonist rather than the intellectual effort of the composer. Emotions like excitement and panic are more prominent than those such as passion and pathos. Music is taught as an activity with definite goals in mind, those goals being Grades 1-8, ATCL, LTCL, LRSM etc. etc. ; panic comes when there is a fear you might not achieve a pass, excitement when there seems to be a real chance of distinction. And it is easy to transfer those concepts to being a spectator to a musical performance. If it’s usual practice to cheer and talk while sportsmen are doing their stuff on the track, it’s got to be all right to behave the same way when musicians are in the concert arena. What’s the difference? On top of that, music, for the exam candidate, consists of single stand-alone pieces. You play three totally different pieces none of which is more than a few minutes in length. Extended structures or complex journeys across emotions have no place in examination repertoire. So, obviously, when there is a break or a change in mood, the piece must have finished and, in place of the examiner’s stern admonition - “And your next piece please” – the void is filled with applause. Candidates at diploma level – in Hong Kong disastrously attempting a diploma hot on the heels of grade 8 - invariably fail to appreciate the concept of a multi-movement Sonata and will often treat this as three totally independent pieces. Indeed, the habit of playing an isolated movement from a Sonata or a single piece from a multi-piece work, is prevalent whenever candidates are given free choice over repertoire. No notion here that a musical work can encompass a wide range of styles, moods, tempi and technical demands, and it’s almost customary for candidates randomly to miss out whole sections of a work simply to keep it within a specified time-framework; time-keeping taking precedence over musical integrity, because a weakness in the former can lead to failure while a weakness in the latter is not seen to impact on the exam result. How many times I’ve had to ask why certain bars or complete movements are cut out, only to be told that “It would have gone over time if I’d played that” – the idea that, perhaps, another programme choice would have been better is inconceivable. There is a solution to this growing problem and, as ever, it rests with teachers. The sterile instruction to pass physical goals has to be removed and replaced by a desire to enrich a student’s intellectual and emotional development. Exams are important, but they are, musically as in every other field, essentially artificial and detached from the reality of everyday experience. Once a student is made aware that the exam situation is false and the concert situation the reality, they will then understand the concept that there is such a thing as concert etiquette. Sadly, Hong Kong shows too much the signs of the exam being the reality and the concert the artificial situation, and while 1300 people might have enjoyed themselves on their own terms, I wish I could tell them just how much more they would have enjoyed themselves if they had known what was really going on in the concert hall.